I have a huge soft spot for Prog Rock, well – to qualify that, I have a soft spot for a handful of Prog Rock albums that I came across when I was first venturing into Science Fiction and Fantasy. Basically I was after anything that looked a bit spacey – or fantasy-esque, with soaring synthesisers and cosmic keyboards that I could listen to while leafing through Science Fiction Monthly and looking at the pictures. SFM itself kind of helped, with Gene Cochran’s article on ‘Science Fiction in Rock Music’ (Pink Floyd, who I only got into much later, and Hawkwind), but it was Yes’s Tales from Topographic Oceans and Mike Oldfield’s Ommadawn that, at the time, pushed all the right buttons. I came across the former when we visited my dad’s accountant’s new house. 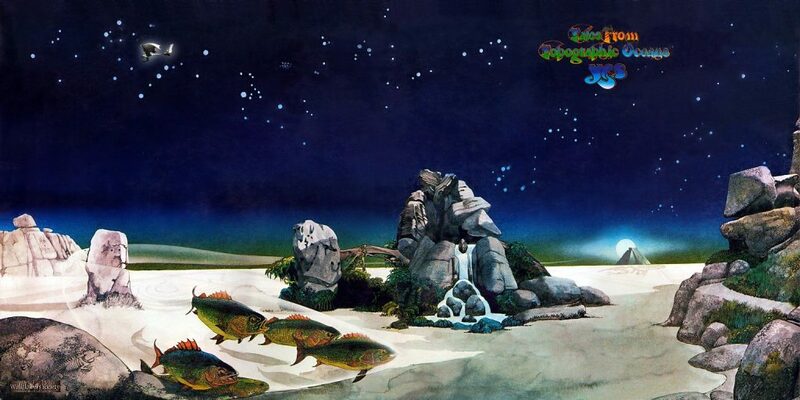 For some reason he always had more money than us and had renovated an old windmill, and was living the 70s dream with white pile carpet, circular water bed and leather Italian furniture – and these wonderful looking albums with Roger Dean covers. He stuck on Tales and I was entranced – for about the first minute. After that I lost interest, although I got into the album more as I got older. Tales from Topographic Oceans was generally held up as the worst example of pretentious Prog Rock – one hour and ten minutes of pompous waffle full of lines like ‘Dawn of light lying between a silence and sold sources, Chased amid fusions of wonder,’ and apart from the occasional burst of genius the whole thing is a bit of a grind, even after lighting a few joss sticks. Having said that it has a place in my heart, I still listen to it on long car journeys, and it has the dubious honour of accelerating the onset of Punk (as well as the departure of Rick Wakeman from Yes). 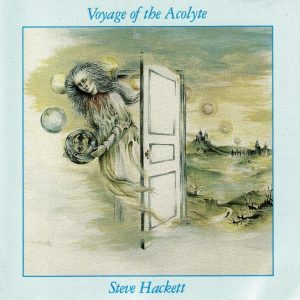 Steve Hackett’s Voyage of the Acolyte is another example of a Prog Rock album that hovers on Spinal Tap’s fine borderline between stupid and clever. Recorded just after Genesis’s Lamb Lies Down on Broadway it really does tick all the boxes – cover with floaty woman holding sphere, check -tracks named after Tarot Cards, check (The Enid would repeat this with In the Region of the Summer Stars a year later – I have a sneaky theory that the sudden upsurge of interest in the Tarot largely came from the first Roger Moore Bond film Live and Let Die – 1973) – flute and twiddly cosmic keyboards, check – oh, and a recording of Nazis at a rally chanting ‘Sieg Heil’ during the track ‘A Tower Struck Down’ because The Tower in the Tarot symbolises destruction and bad stuff (there’s also a parrot and someone coughing – a bit of Dada I guess). And finally with lyrics like ‘Again renewed by the vessels of Isis, You’re ready to fly’ Voyage of the Acolyte really is in danger of displacing Tales from Topographic Oceans from its pinnacle as Rock Music trying very desperately to be profound, artistic and meaningful and utterly failing. And yet the album does have some genuinely lovely moments. 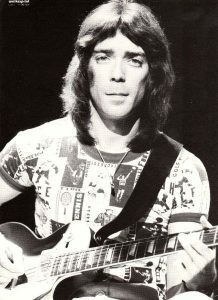 Steve Hackett managed to collect together an impressive set of musicians and singers – Phil Collins is the one rabbiting on about Isis in ‘Star of Sirius’, and Sally Oldfield is mesmerising on the last song ‘Shadow of the Hierophant’, (another sadly underrated musician swept under the carpet by Punk and ultimately exiled to Germany where she trotted out an increasingly desperate series of easy listening albums while struggling with chronic fatigue syndrome). The music, on the whole, plods along in rather a curious, heavy handed way. 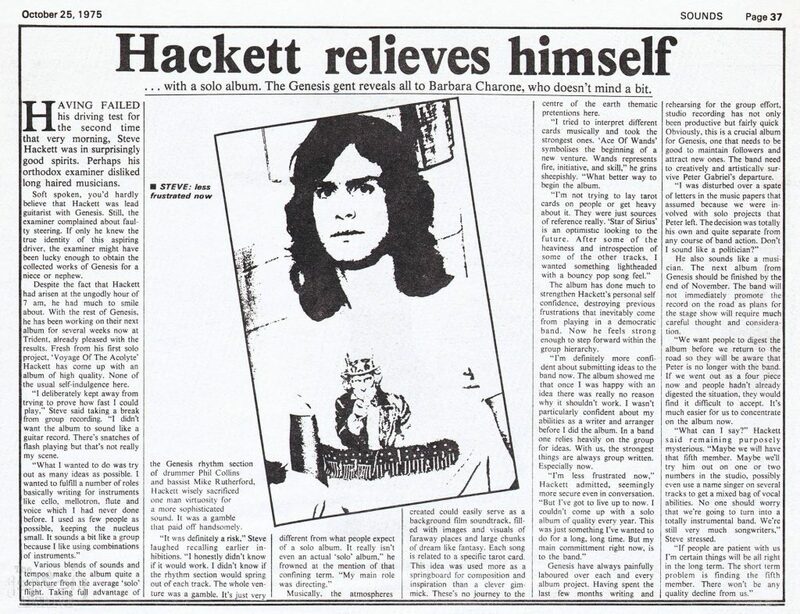 For example John Hackett’s flute solos that usher in the two parts of ‘Hands of the Priestess’ (she turns up again after Hitler to calm us down with her healing powers) sound like someone panicking through their A-Level music exam, and the song ‘The Hermit’ that concludes side one, while charming, ends up a wee bit dirge-like. And then, once in a while, the album bursts free into a glorious soaring chorus or crescendo that makes you wonder why the rest is so clunky. This is particularly noticeable with the brilliant jazzy introduction which hints at further wonders that are never quite delivered. 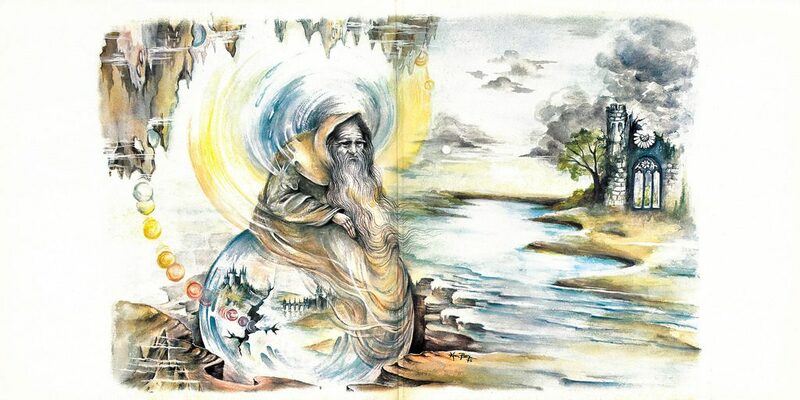 So Voyage of the Acolyte ends up being an unsatisfying album that both manages to end up a parody of Prog Rock at its worst, and a hint of what it could achieve with just the right combination of music and vocals. The annals of the movement are littered with records like this – one-off bursts of sporadic genius mixed up with clunking pedantry that end up going nowhere, or in completely the wrong direction (Mike Oldfield is a perfect example of this kind of brief flash of brilliance followed by endless records that should have never been made, post Encore Tangerine Dream are another). But nevertheless, if you are lighting a joss stick and cracking open a Dragon’s Dream art book then you can’t do worse than stick on Voyage of the Acolyte in the background.